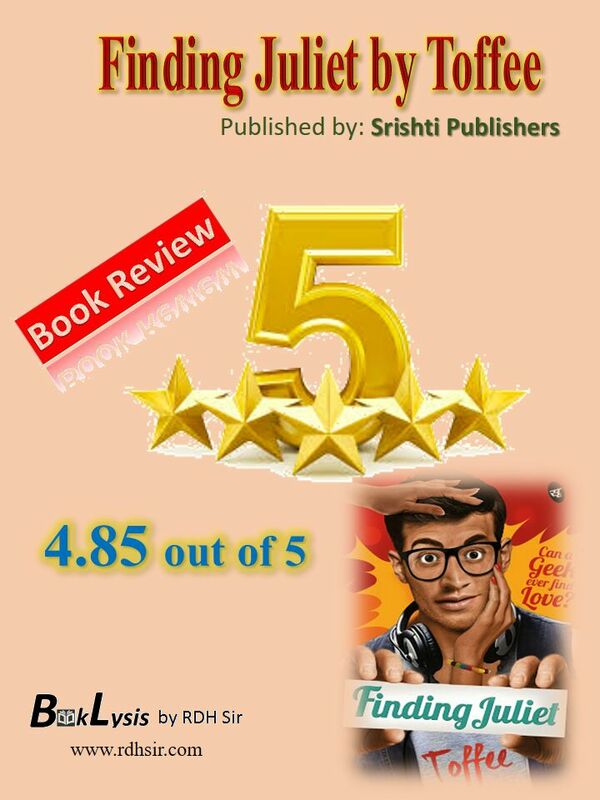 BookLysis by RDHsir.com: FINDING JULIET - Can a Geek ever find Love? by TOFFEE : 4.85 of 5* to Romantic novel on Love, lust & Life! After a long gap; I am back with one more Book Review! 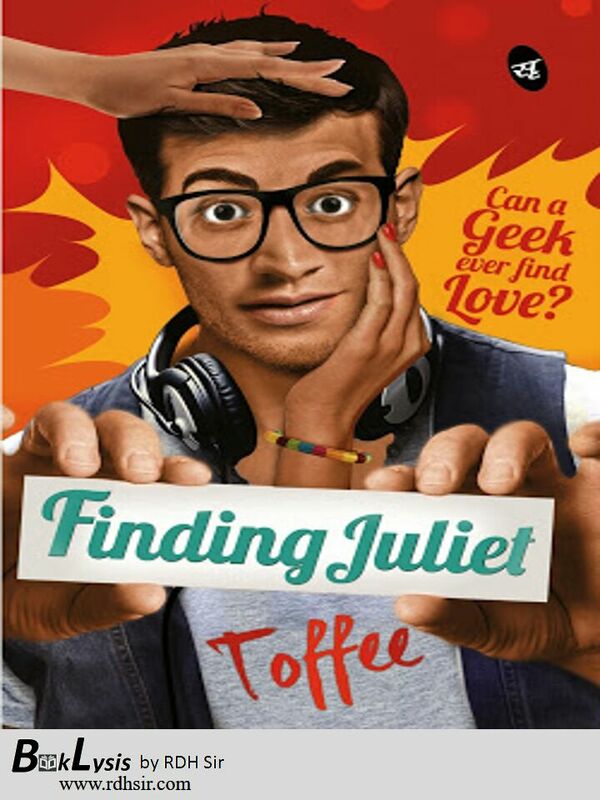 Today I am going to share my views on Finding Juliet by Toffee. Finding Juliet is indeed an attractive title which reminds me of Romeo and Juliet by William Shakespeare and Finding Juliet by Frank Sennett, but there is no direct correlation as such with this new book. This book was first published as a digital book on Juggernaut online application and later published by Srishti Publishers in paperback format. This is my fourth book review of the book published by Srishti Publishers. The beautiful cover of Finding Juliet is designed by Wasim Helal. A guy is portrayed in the witty pose. The book asks readers “Can a Geek ever find love?” This question can be considered as the subtitle of the novel. Finding Juliet is scripted in a very lucid language and adds some new words in my vocabulary. The author narrates the story in a fast but flowing pace. Author’s wonderful sense of humour, witty and sarcastic dialogues along with beautiful lyrics at apt situation cherish reader’s reading experience. Flashback technique is used in a fantastic manner. Arjun is a male protagonist of the novel Finding Juliet. He is the narrator of the story. Krish is protagonist too who is one of the best friends of Arjun. Finding Juliet is a well-characterized novel but readers might get confused to identify the main female protagonist from so many female characters like Shraddha, Neha, Saakshi, Ruchika, Esha, Aditi, Smita, Preeti and Anjali. The plot of the novel ‘Finding Juliet’ is developed into two acts. The first act of the story runs in and around Begumpeth, Charminar and Dilsukhnagar in Hyderabad while the second act of the plot is played in Bangalore. I appreciate the light weight of the novel but average page quality of the novel can’t be ignored. Italic font is used in a good way but it could have been better. I have purchased a brand new copy of the newly released novel, even then I have noticed some faded words in the book. Faded words in the newly launched books are quite unacceptable. I found a single typing error ‘Ireached’ on page no. 12 which should be corrected as ‘I reached’. Closing inverted comma (’) is missing into 31 paragraphs of Krish’s and Sanjay’s monologues in the chapter ‘The Void’ and (“‘) is misprinted instead of (“) in a sentence on page 196. I must say that though I have pointed out drawbacks, all these drawbacks are ignorable when we think of the superb story and plot of the novel. Dejected by games played by girls and fate, he leaves Hyderabad for Bangalore and ends up meeting Krish, an irresistible flirt. He understands Arjun’s predicament, pacifies him with his words and enlightens him about the most complicated species ever created by God – Women. And then, Arjun’s life changes forever. Join Arjun as he tries to figure out women and discovers the meaning of love, lust and life… all in his journey of Finding Juliet. Toffee is a simple guy who loves the complications of life. He used to write code by the day and books by the night earlier. But currently, he is busy writing assignments and chasing deadlines in his Master’s in Business Analytics from the University of South Florida. Toffee loves narrating interesting stories with subtle insights. Through books, he wants to share beautiful stories, reach out to people and touch their hearts. Finding Juliet is his second book, written specially for India’s Generation-Y. Srishti Publishers can be reached at Facebook, Twitter (@Srishtipub) & Website. The Reviewer (RDH) can be reached at Facebook (Page), Facebook (Profile), Twitter (@RDHSir) & GoodReads. Some quotations are used in this review from the novel Finding Juliet with the only purpose to give a reference to the particular scene. This is my honest opinion about the novel Finding Juliet by Toffee and your views may vary. 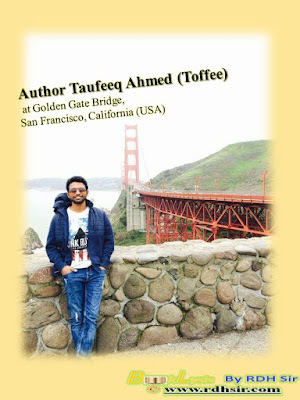 Rajesh D. Hajare (RDH) asserts the moral right to be identified as the author of this review (BookLysis) of the novel Finding Juliet by Taufeeq Ahmed/Toffee. Long time Sir! Once again a very neat & clean review it is. Perfect observation Sir. I would like to say one thing that, I can actually visualizing the characters through your review. And I think that we all should have a true, caring, genuine friend like Anjali. The quote from Arjun’s words, which you have mentioned here, is actually very true realization indeed. Of all the one liners, I’d like to mention the best according to me which is the no. 5- “Just because a goalpost has a goalkeeper, it doesn’t mean you can’t score goals.” #FindingDrawbacks… it is the new style of the heading you opted specially for this review according to the flow with the title of the book #FindingJuliet. Very accurately pointed out some of the printing errors and you are always very careful about this, I know. Well done Sir. Keep this going. Is bar bohot intezar karwaya apne, waiting to go through your next review. Thank you Sir. Thanks sir... I am speechless!! I am glad that you like my review. After a long time but beautiful indeed. 'Finding Drawbacks' instead of 'Drawback'is nice turn. Hope to see my book's review soon on this space ��. A deep review about the book sir. Best wishes.